Build your own quilting frame from our plans. Moritz Designs now offers detailed, CAD-drawn plans which show how to build a solid oak quilting frame like the ones pictured on this page. Since quilting has experienced a resurgence in popularity, there is now a huge demand for quality quilting frames such as this one. These plans list all the hardware and wood needed, and show every step needed to complete the project. The frame does not require large, expensive woodworking tools to build-- a common tablesaw and saber saw are needed. If you have a bandsaw, it makes curve-cutting easier. The CAD-drawn exploded view of the frame shows in detail how each part aligns to the others. 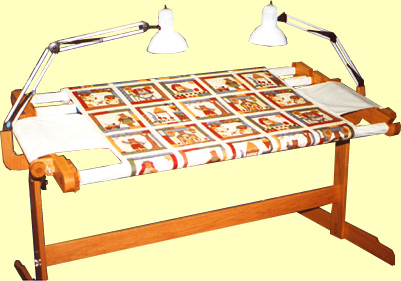 These pictures show the 60-inch wide frame which is suitable for twin-sized quilts and smaller. The plans also give instructions on building a 94-inch frame that is capable of queen-sized quilts and smaller. These frames are as beautiful as they are functional. When they are not being used for quilting, they can either be used as a quilt display stand, or can be disassembled for storage. The oak can be stained to match one's furniture if so desired. Our plans also include instructions for mounting swingarm lamps to the frame. These lamps can be seen in this picture. On the last page of the plans are instructions for loading the quilt onto the frame. If you need additional copies of these instructions later, we have them available here so you can print them out.